Wandering Chopsticks: Vietnamese Food, Recipes, and More: Who's Hosting Weekend Wokking? ***** Rules for Weekend Wokking Weekend Wokking Round-Up Who's Hosting Weekend Wokking? 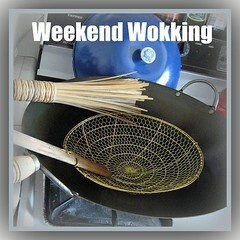 Weekend Wokking Host Duties We Wok! *****Please check Rules for Weekend Wokking if you have any questions. If you're hosting, please see Weekend Wokking Host Duties. You may host more than once if you wish. Priority is given to frequent contributors to Weekend Wokking. For entries, please put Weekend Wokking in the subject line of the email to make it easy for the host to identify entries. Also, include what name you would prefer to be called, the name of your blog, what part of the world you want identified as your residence, the title of the recipe, and a link to the recipe. One entry per person please. Remember to send entries to the host by 11:59 p.m. on the Sunday prior to the round-up date. If you'd like to host, send me an email at wanderingchopsticks (at) gmail (dot) com . Also, please remember to thank the host(ess). The round-ups take quite a bit of work to compile so it's nice to show some appreciation. June Roundup on Wednesday, June 2. Hosted by Wandering Chopsticks. Please send entries by 11:59 p.m., Sunday, May 30 to wanderingchopsticks (at) gmail (dot) com . The secret ingredient challenge is SPINACH. Thanks! I hope you participate. It's great fun seeing all the different variations each month. All the info for each month's event, including the ingredient, is in the rules post.